Are you a gun owner looking for one of the best gun lubricants on the market? 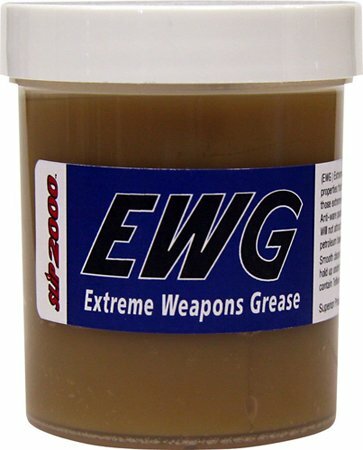 If you answered yes, then let us introduce you to the gun lube called Slip 2000 Extreme Weapons Grease (EWG) from SPS Marketing, Inc., who purposely made the lube to be used for reducing friction and wear on rifles, pistols, machine guns and automatic rapid-fire. And boy does it perform a wonderful job mitigating both friction and wear on your weapons! The makers designed the product with an exclusive metal treatment that when applied sees the lube make its way into the micro-pores of the surface of the metals of your weapon and allowing the lubrication process to take place from within the metal itself. This is why the Slip 2000 EWG is very effective in lubricating. And while lubricating, the lube automatically prevents your weapon from producing excessive heat while at the same time reducing excessive wear. And as if all that is not enough, the Slip 2000 EWG also has the ability to protect your weapon from corrosion. This lube isn’t like the average gun lubricant on the market in the sense that it has the ability to stay wet up to 5 times longer. It saves your weapon from excessive friction and wear. Protects your weapon from corrosion. It doesn’t attract things such as dust and dirt. It is not only safe on the metal parts of your weapon but also on the wood and plastic parts too. It doesn’t take much time to clean. It is safe, non-toxic, non-hazardous and biodegradable. You do not have to heat the metal to ensure proper absorption. The grease will penetrate on its own. You do not have to clean off the gun parts (from petroleum products etc.) before applying the grease. The grease will clean off any old oil. Despite being easier to cleanup than most gun lubricants on the market, some customers still find it pretty messy. As a result of the many good attributes that come with this product, many consider it one of the best brands of gun lubricants on the market. Not only does the Slip 2000 EWG significantly reduce friction and wear on your firearm but it also enhances the performance of the weapon in no small way.